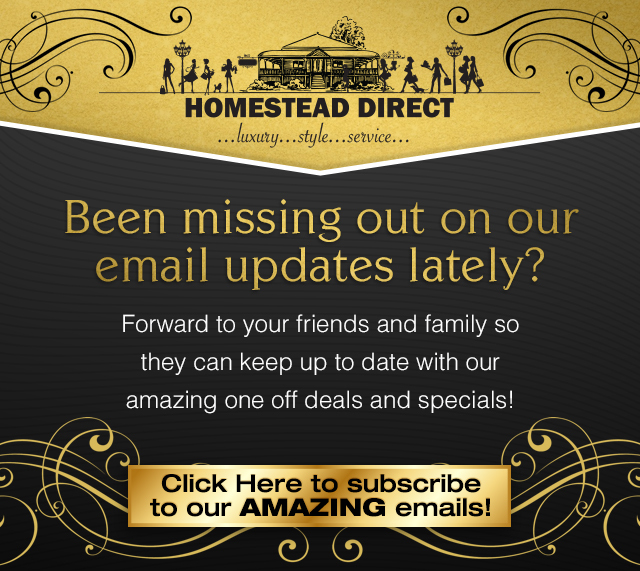 Welcome to Homestead Direct – the world of Luxury! Shop online from the comfort of your own home. Homestead Direct with a reputation for nearly two decades of Quality, Tasteful choices and Service We are the leaders, and at the forefront of the silk scarf fashion industry! We provide unique, exclusive products, inspiring you for your gift giving, and fashion accessories with fast turnaround. Purchase a HSD Gift Card, which looks beautiful as a gift – it’s the perfect way to say ‘ Thanks’ or ‘ Happy Birthday!’ - and the choice is theirs! Babies Washers, Dummy Fasteners, Petite Dummies, Baby Brooch, Baby Bracelet - we offer engraving too! Fashion Hair Slides and Silk Scarves : Christian Lacroix, Kenzo, Echo, Mantero, Liberty of London, Richard Allen and more! Jewellery Repairs – Please email info@homesteaddirect.com.au or phone 0447 126 711 for a quotation. When it comes to fashion accessories, Homestead knows what is up and coming! Our scarves are FRESH new designs! Make a statement with one of our scarves! Inject a shot of style into your wardrobe this season with a bright printed silk scarf – dynamic designs. You will love the current colours and textures, patterns that come straight off the runways in Paris and Milan. Live colourfully or keep smart in classic black and white. Inspiring new season designs arriving all the time… Live Wear Create! Phone our Scarf Team for a scarf consignment today, to be sent direct to your door! Remember, we do exquisite Gift Wrapping! P.S. All prices on our online store are in Australian Dollars, if you are purchasing from overseas your GST is taken off, so it makes for cheaper postage! How To Tie A Scarf - Full Version from Echo New York on Vimeo.